In this difficult economic condition, everyone is trying to save and make budgets if they can. In this article, I am going to outline the tools I use to manage my finance. I am still not an expert with my expenses, but I think many of us could use some of the tools to better manage our lives. First of all, I am a plastic lover – meaning most of my expenses are either with a debit or a credit card. I prefer it this way, because at the end of the day you can keep track of every single expenses you have and at the end of the month, you can analyze your expense in a very detailed manner. In fact, most of the card services have in-built application that would help you to determine how much you are spending in different categories, such as – mortgage, food, utility, gas and so on. If your card service does not have this feature, fear not, try www.mint.com. I am using mint for many years now. It keeps all of your records. In fact, I have my expense records since 2008 in my mint account. Most banks would only keep your statements for a certain range of time. Some banks would let you access your monthly statements up to 12 previous months. However, you can still order paper copy and pay the service fee for statement previous to the available online documents. 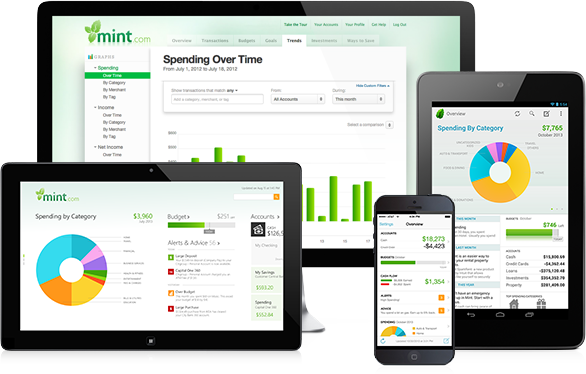 Mint has various apps for iphone and ipads also and I have successfully connected to all of my bank accounts without any issues – Bank of America, Chase, Citi Bank, State Firm and so on. You can also add your 401k account to mint. Once you have all of your accounts added to their service, you can see the Big Picture of your finance. If you like to check how much you you have spent at the Walmart, you can do it quickly. You can set a goal to pay off your credit card, or set another goal to save money for your dream vacation. Mint also helps you to produce time series graphs of various kinds – net worth over time and so on. The other service that I like very much is from www.creditkarma.com. They are somewhat similar to mint.com but serves a very important purpose of your finance – your credit worthiness – for free. Yes, you read it right, once you open a free account with them, you get free credit score and free alerts to any credit activity you have. It not only helps you to better manage your credit score, but also allows you to stop any potential credit card fraud. Why I am writing this article? I live in a 4 family household and I wanted to check how much I have in food/grocery spend in May 2014. Mint said, I spent close to 1100 bucks on food. The “Official USDA Food Plans: Cost of Food at Home at Four Levels, January 2012” says monthly cost for a 4 -family household could be as high as 1244.3 USD in a liberal plan. You could however spend as little as 629.1 USD in a thrifty food plan. So, I am at the high end. There must be opportunities to reduce some of the cost here. I hope this article would help you to find some of the places you could save some money too.